Powered equipment: 12 months or 2000 metered hours from date of purchase, whichever is the sooner, provided the equipment is subject to an appropriate Maintenance agreement provided by TMHUK Ltd or an approved service provider. Manual materials handling equipment: 12 months from date of purchase. 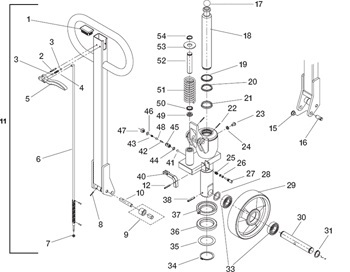 equipment is rendered defective through lack of maintenance in accordance with the manufacturer’s recommendations, improper usage, wilful damage or the fitting of parts other than those specified by the manufacturer. This warranty does not apply to proprietary equipment but TMHUK Ltd will pass on the benefit of the manufacturer’s warranty (if any) insofar as it is able so to do. The lifetime guarantee is only applicable to the standard LHM230 product only and is subject to special terms and conditions, details available on request. Call charges to 0871 numbers apply, check call charge section.